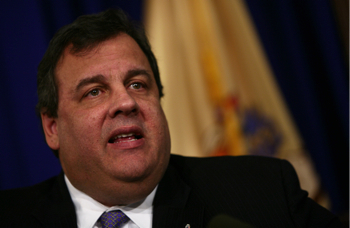 Governor Chris Christie calls out videogames, but notes that no one issue is to blame for frequent shootings. New Jersey Governor Chris Christie recently appeared on CBS This Morning to discuss his state's gun control agenda and - wouldn't you know it? - Call of Duty somehow made it into the conversation. When listing the factors that he believes play a role in the all-too-frequent shootings that pop up around the nation, Christie notes that Activision's popular shooter franchise has no place in his home. "We've got to talk about the violence in these videogames," Christie explains. "I have four kids at home. I don't allow Call of Duty and these other games in. We've got to start talking about that, as parents." But while the quote may appear to use gaming as a scapegoat, Christie also listed several other categories that he believes warrant review, including the stigma surrounding mental illness, substance abuse, and tighter control on firearms. For the record, gaming was the last topic he brought up. This is obviously a touchy subject for just about everyone, and there are deeply entrenched opinions on both sides, but I think just about everyone can agree that a tragic event like what happened in Connecticut doesn't have a singular cause. Whether you believe that videogames play a role - along with other "violent" media like movies and even news reports - is of course up to you.